best of the location in Rome - next to spanish steps, metro stations and a few mins walk to trevi fountain, pantheon, termini. tastefully decorated apartment in a quiet and a very safe neighbourhood. Extremely helpful staff from romeloft.com, made us feel at home in Rome. Centrally located, great base for exploring Rome. Location is perfect and safe! Betto(our key holder) is very kind! Everything was good except for bathroom. My sister and I had a difficulty to take hot shower. I want to visit Rome again! The living room is elegantly and stylishly furnished with a comfortable queen size bed. There are also scandinavian Le Klint lights, a pull out armchair (which is great for a child to sleep on), a 27″ flat screen TV, and a Hi-Fi system with a DVD player. You will also have access to WIFI Internet and an air conditioning unit. 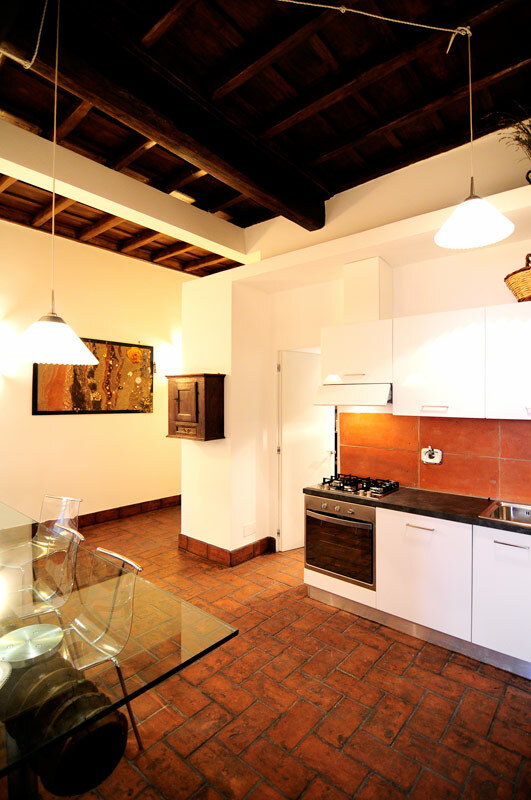 Wooden ceilings and a typical “cotto” tiled floor are some of the lovely original features of this loft apartment. 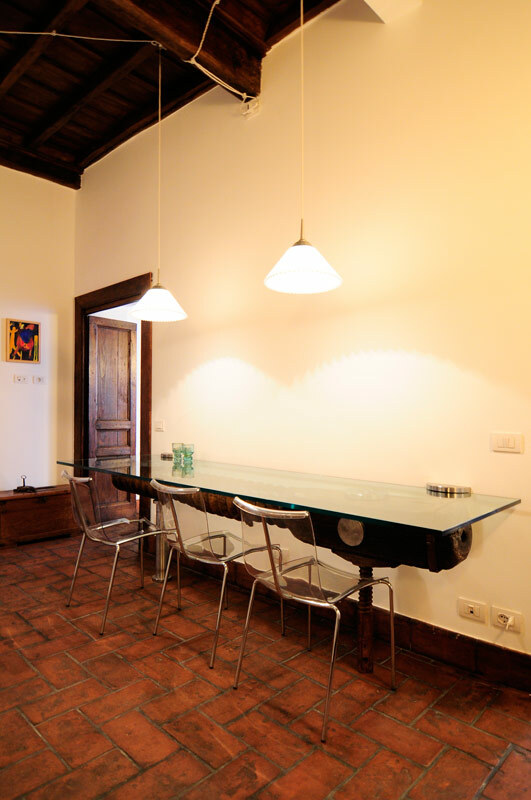 This property is furthermore a peaceful oasis in the heart of the bustling city of Rome. The well-equipped kitchen together with the dining area, which contains a stylish glass top dining table, are separate from the living room. This makes it possible to have a nice dinner at home as an alternative to dining out in the evenings. The kitchen has everything you need to prepare a delicious home-cooked meal. Why not choose ingredients from one of the city’s famous fresh produce markets? There is also a gas stove, an oven, a fridge, and a freezer. Next to the kitchen, the bathroom is an example of contemporary design, with a modern sink and a shower box. Although it is a small unit, you will feel right at home in this lovely apartment, with everything you need to make your holiday unforgettable. This is in Rome’s center, a few steps away from Piazza Barberini. Moreover, you can reach the Spanish Steps and Fontana di Trevi within a few minutes. This neighborhood is truly delightful. There are lots of elegant boutiques, delicious restaurants, and historical sights. It’s the perfect base for first-time visitors to Rome. 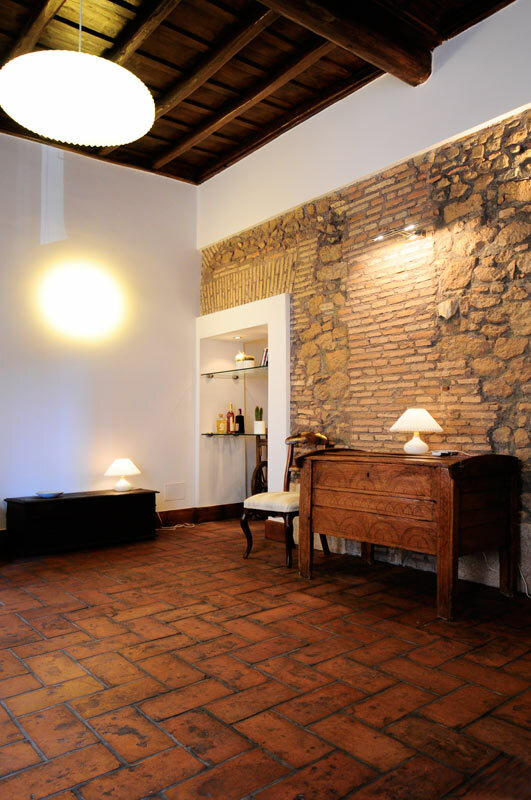 From here, guests can make the most of the apartment’s proximity to some of the loveliest squares in the city. Alternatively, you can walk to the beautiful Villa Borghese park, a beautiful spot for a romantic evening stroll. Don’t miss the viewpoint, with panoramic vistas out over the entire city! In the evening, you can head to one of its many elegant bars or restaurants. We would recommend wandering over to the Trevi Fountain after such an evening. This way you can enjoy both its night time illuminations as well as a greatly-reduced crowd of eager onlookers looking for the perfect photo opportunity. This area also lies on the Metro A line, which means you can use the simple-to-follow metro lines to get to the Vatican City, Colosseum, and central station, Termini. 5 people are currently looking for apartments in Spanish steps area. Reserve yours now. We were met at the apartment by Matteo who showed us around and gave us a very needed glass of water each. (The day we arrived coincided with a rail strike so the metro was not operating and we had to walk from the terminus). He then showed us a map of Rome with recommended places of interest marked on it. This is left on the table for visitors to ...Read Morerefer to during their stay. He gave us recomnendations of where to eat the best spaghetti, where to get the best tiramisu and ice cream and who served the best coffee. We found these to be very useful, all the places he told us about turned out to be excellent. The apartment had everything we needed for a 5 day stay. The large spacious lounge has a queen sized bed and a long sofa. It is very comfortable and airy. There are two large windows that open onto the interesting street and although this can be noisy, the noise is almost completely shut out when the windows are closed. There is air conditioning. There is a kitchen and a bathroom and a hallway with a huge wardrobe to store clothes, cases, shoes etc. It is a short walk from the metro stop Barberini, situated between the Spanish steps and the Trevi fountain.There are a lot of leather handbag shops near by so prepare to be tempted. Up towards the spanish steps there are some designer shops like Gucci where you can window shop at night and laugh at the exorbitant prices! There are many pasta restaurants close by and if you want to self cater there is a supermarket in the road opposite. Matteo kept in touch by text and on Sunday morning he told us about a local flea market and how to get there by bus. We did go and found it to be huge, selling everything you could think of, very reasonably. We found the whole experience of staying in this Rome Loft a pleasure. We would love to return to Rome and we would definitely try to stay in this apartment again. Well done to Rome Lofts and especially to Matteo who was so polite and helpful throughout our stay. My husband and I spent 18 days in this apartment in July and August 2015. The location, air conditioning, and comfortable bed were the great advantages of the apartment. While the bathroom, specifically the sink were not functional. I highly suggest to change the sink with a practical one. The internet was not high speed and the Wi-Fi was only acce...Read Moressible in the kitchen. The floor, the sofa, and the armchair should be deeply cleaned. Lack of washing machine puts the guests who intend to stay for a longer time in trouble. 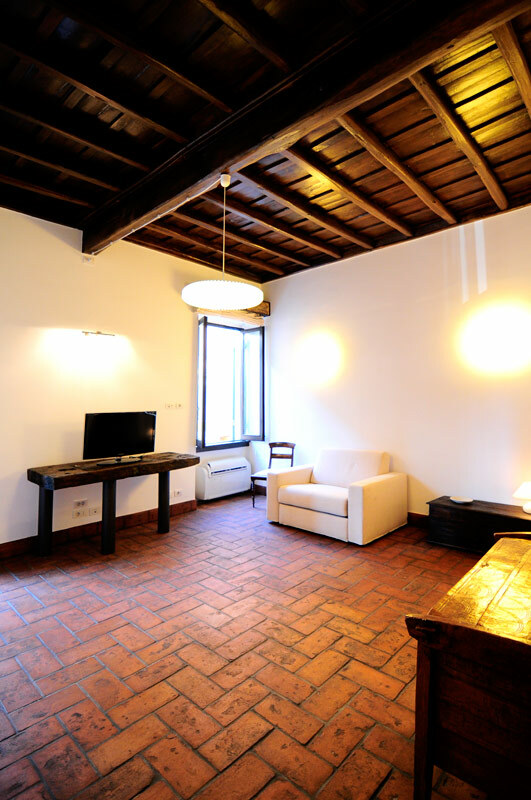 Generally, we enjoyed our stay in Rome and in this apartment and the above suggestions are just to make it perfect. Apartment is very well located near all the major attractions. Noise from the street does not worry me and in the morning I heard the church bells and I like it. In apartments you will have everything you need for a comfortable stay. The bed you will especially appreciate, the best pillows and the duvet! I'm glad I spent my Roman holiday i...Read Moren this appartment. Great apartment! A very good location, a good kitchen, nice bed and a homely feeling. The wi-fi worked most of the time, but not always and not in the whole apartment. 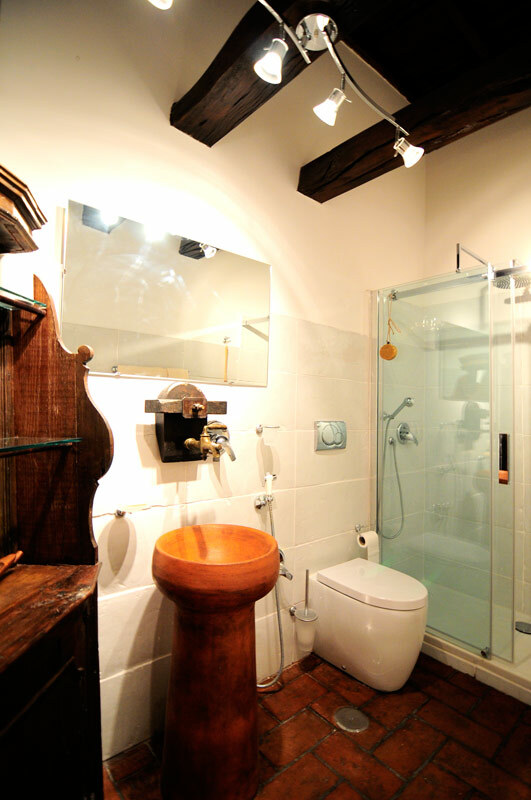 This apartment was ideally located, halfway in between the Spanish Steps and Trevi Fountain. The loft was immaculately presented and decorated, with fine attention to detail, to include a honesty bar, welcome introduction from the owner with restaurant recommendations, maps and guides. A nice selection of dvd's, books and cd's and the bes...Read Moret part - the most comfortable bed ever!